Rating: G - Warning: Serious fluff ahead! Happy Birthday, my dear Rena! May your special day be filled with happiness and love. who so generously supplied my brain dead self with this adorable plot bunny. "Okay, Gus, are you ready? Let's twist them apart and eat the creamy insides first. They're better that way." "I like the pretty colors in the middle, Justin. Don't you?" "I do. Here's your milk. You can't eat chocolate cookies with pretty colors in the middle unless you dunk them in a big glass of milk. Careful. Don't spill it." "Can we bake rainbow cookies every Saturday?" "Hey, you two! I thought I detected the distinct aroma of sweet things baking in the oven down here! Just couldn't resist stuffing your tummies with sugar and fat, could you?" "Here, Daddy. Have one. Justin and me baked them." 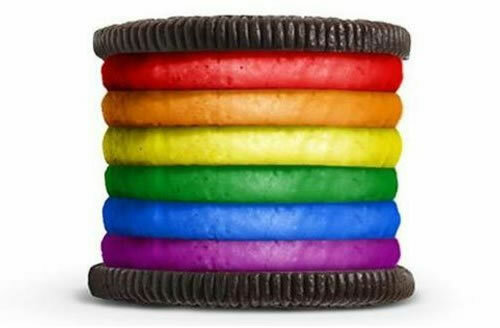 "Chocolate cookies with rainbow middles? How . . . prideful?" "Gus and I just felt like experimenting a little, didn't we, Gus? We think they're pretty." "Pretty gay. What are the munchers going to say when he goes home and tells them what you've been up to? I bet your moms don't bake rainbow cookies, do they, Gus?" "No. But they have a rainbow flag. And they have a rainbow tablecloth. And they bought J.R. and me matching rainbow tee shirts. 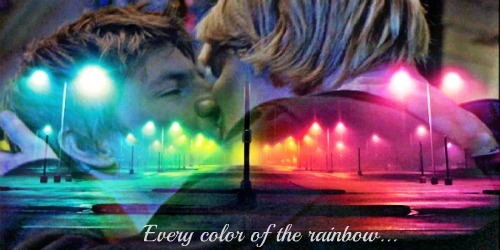 They said they're proud to be gay and the rainbow is a symbol of that." "They said that? Well, Justin and I are proud to be gay, too. Maybe I will have one of your homemade rainbow cookies. It's not seven yet, is it, Justin?" "Ha ha, Brian. Here's the milk. Knock yourself out." "Can I be gay, too, when I grow up?" "You can be anything you want to be, Gus. Never let anyone tell you any differently. You have to follow your heart and be true to yourself, and always be the best you can possibly be." "Okay, Daddy. I'll be the best gay guy I can possibly be. I really want to be gay. You know why?" "Because you admire my fabulous sense of fashion and taste in decorating?" "Because I want a partner who'll bake chocolate cookies with pretty colors in the middle for me on Saturdays like Justin does." "Can't argue with that, can I, Sunshine?" "The boy has a point." LOL Yeah, the first thing I thought of when I saw the ad for those yummy looking cookies was, "Where can I get some?" Yeah, I totally love the three of them as a family. I love how Gus reasoned his future out perfectly while teaching his dad a lesson at the same time. Children see things so clearly, don't they? LOL I'm just glad Brian was receptive. So sweet and Gus saying he wants to be gay so his partner will make him cookies every Saturday made me smile. Brilliant. "Because you admire my sense of fashion and taste in decorating?" And that's true, he has a pint!! Love the picture of the three of them together. Always a pleasure to read your work. Thank you friend! Beautiful, I loved loved loved it!! !